3D stereovision Technology with Wi-Fi tracking technology. Most Powerful Processor ensure a 95%+ accuracy. 1 Year manufacturer hardware warranty on all equipment’s. 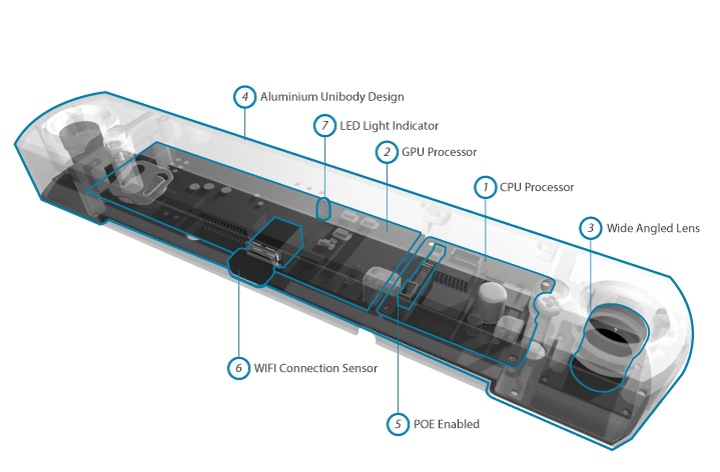 Our 3D+ wifi is embedded with a powerful 1GHz processor, specifically to run its complex video processing algorithm. This processing capabilities is equivalent to a full version computer, all compacted into the People Counter. Our GPU Processor is powered by the latest algorithm which uses both color and texture pattern to identify the person, producing far superior accuracy than when using color pattern alone. Our algorithm can also achieve real time performance for a high definition stereo system processing of 1024 x 1024 images. Our counters are equipped with lenses which provides 180 degree wide angle view in ensuring good depth of view as compared to telephoto lenses. The wide field of view will also make sure a complete coverage to achieve highest accuracy. The whole casing is cast from one piece aluminium oxide alloy. This is the similar manufacturing method used by Apple Macbook, giving a discreet aesthetic appearance and superior heat dissipation. Our counters are powered using Power over Ethernet. Only one Cat5e cable for power supply and data transmission purpose is required in the installation process. It is aesthetically more pleasing compared to other people counter which requires running more than 1 cable for the installation. We are the first in the world to combine video analytics counting and Wi-Fi deacon tracking in one device. Being a Wi-Fi hotspot itself, it can detect the Wi-Fi signals emitted by the smartphones and distinguishes the individual by the unique MAC address. This can optimize the street traffic and draw in rate, dwell time, cross shoppers and returning customers. Our counter is equipped with the simple RGB LED light which change color based on the status of the power, system and the network stability. This enables the simple diagnose of the hardware issues which can efficiently lower the support cost required.